CPESCs are trained, tested and certified to the highest standards. CPESC following your name demonstrates qualification and provides confidence in your ability. CPESC team members ensure that projects run according to regulation, are permitted efficiently and perform exceptionally. Each course is designed to ensure the applicants understand which concepts will be covered by the exam and act as a review for most of those concepts. Because this certification is meant to identify experienced professionals all concepts will not be reviewed in detail during the review course. Applicants for the exam are expected to have a sufficient combination of education and experience to be able to independently study the materials identified in the General Principles Review Manual. The Manual also serves as the Review Course outline, you may download the CPESC- Study Guide -TOC to learn more. Renewals must be done annually via the ECI Certification Portal. CPESC current renewal cost is $140, CPESC-IT renewal cost is $80 annually. Renewals must be done by the date shown on the certificants’ wallet card, late renewals are subject to a $40 late fee. When using a debit or credit card a $6 third party credit card fee will apply. Registrants are responsible to participate in activities within their annual renewal period that satisfy the requirements for each certification they hold. 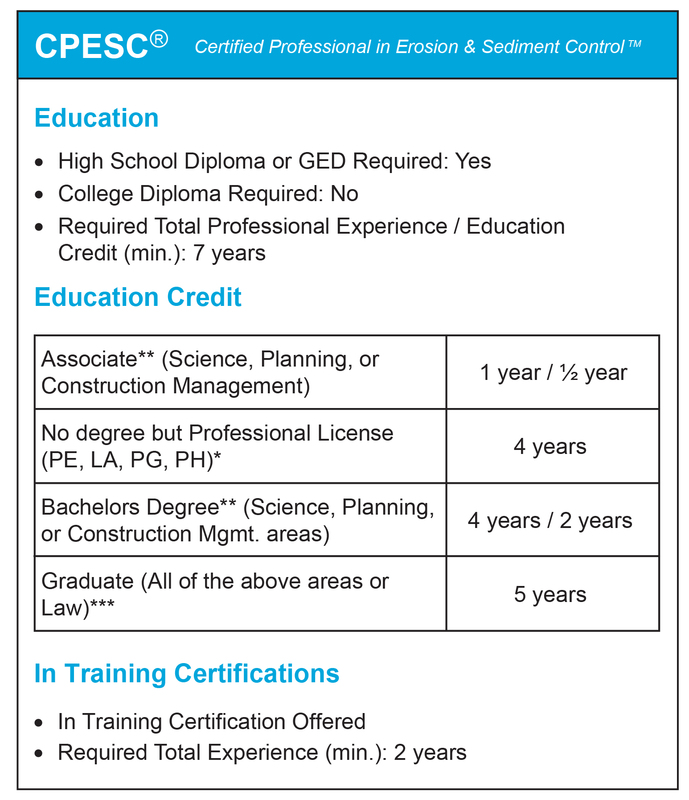 CPESC Certificants are required to complete 8 PDHs during their certification year. CPESC-IT are required to complete 4 PDHs each year. PDHs may be recorded in a log but must ultimately be added to each registrant’s profile in the EnviroCert Certification Portal. PDHs are required for successful renewal. Please review the Professional Development Policy for detailed explanation of qualifying courses. Each year a minimum of 1% of Certificants’ PDH records are audited by EnviroCert. Looking for a CPESC for your team?